Summer is just around the corner which also means a change in the types of fragrance that I wear. 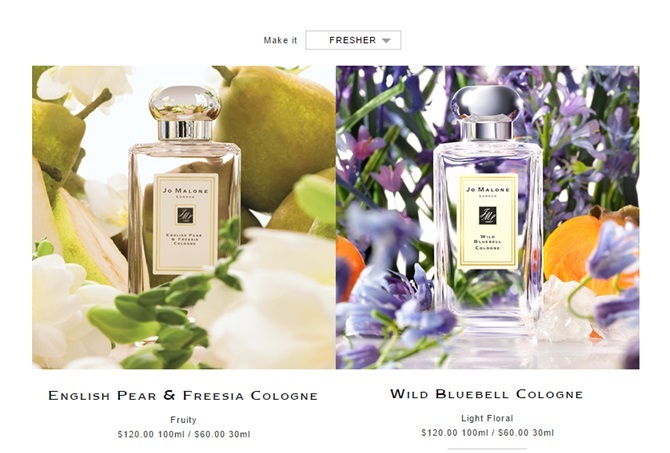 I don't like heavy scents or anything too sweet, especially when the weather gets hot, so I have been reaching for my go-to fragrance combination of these two Jo Malone cologne: Wild Bluebell & English Pear & Freesia. 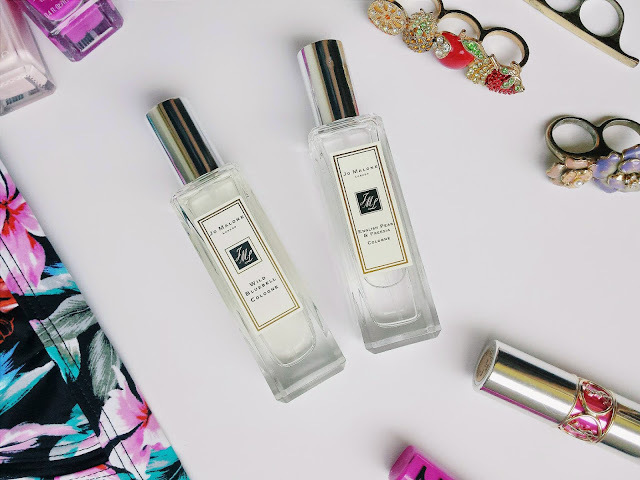 I still remember going to the newly opened Jo Malone counter by my local Nordstrom and checking out the counter and instantly falling in love with English Pear Freesia. The lady at the counter brought up scent combinations and layered English Pear Freesia with Wild Bluebell and I also instantly fell in love with this combo. They smell great alone, but when paired together with my body chemistry, it just takes it to a whole other level! "Vibrant sapphire blooms in a shaded woodland. The delicate sweetness of dewy bluebells suffused with lily of the valley and eglantine, and a luscious twist of persimmon. Mesmerising." - description from Jo Malone. "The essence of autumn. The sensuous freshness of just-ripe pears is wrapped in a bouquet of white freesias, and mellowed by amber, patchouli and woods. Luscious and golden." - Description from Jo Malone. 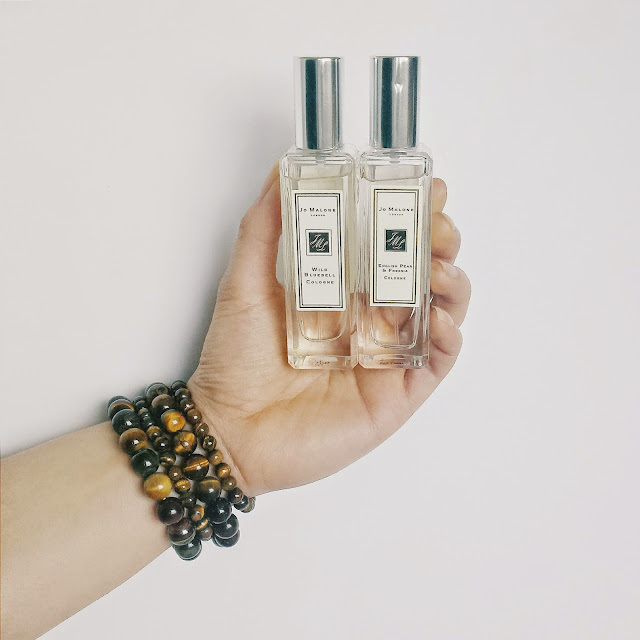 Jo Malone's website also features their signature 'Fragrance Combination' where they can help you find a scent to pair with your favorite one making it warmer or fresher. For English Pear & Freesia as my base, combining it with Wild Bluebell makes it a fresher scent (as opposed to a warmer one) and as I said before, I absolutely love it! The scents on their own are so pure and clean that you can distinctively smell what the scent is supposed to smell like from the notes. I do wish the wear time was a bit longer on these, but I love the scent enough that reapplying is that big of a hassle. These are a bit of a luxury product and the whole brand in general (especially with their body creams!) so they would make a perfect treat to yourself or even as a gift. 1 oz bottles of their cologne cost $60 and 3.4 oz bottles for $120. I highly recommend checking out your local Jo Malone to give these scents a sniff to see if you find your new favorite one (or combo!). Readers, have you smelled Jo Malone fragrances before? What are your favorites?! Let me know!